Jasmine van den Bogaerde may be just 17, but she is no stranger to the music industry. At 12, she won the Open Mic UK competition, and a couple of years later, she hit the charts with her first single, a cover of Bon Iver’s “Skinny Love.” Her debut album was almost entirely covers, but her latest release, Fire Within, shows that Birdy’s skills also extend to writing. 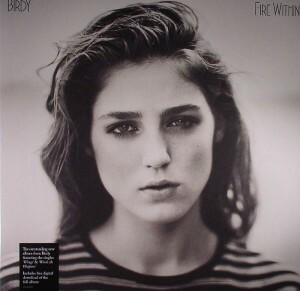 Given that Birdy has collaborated with some top writers and producers on this album (including Ryan Tedder, Jake Gosling, and Dan Wilson), the consistency between the songs is incredible. The motif of light throughout works well with the album title, and even as Birdy sings about heartbreak and disappointment, her strength is easy to find. For a proper debut as an artist finding her own sound, Fire Within is an album worthy of envy.